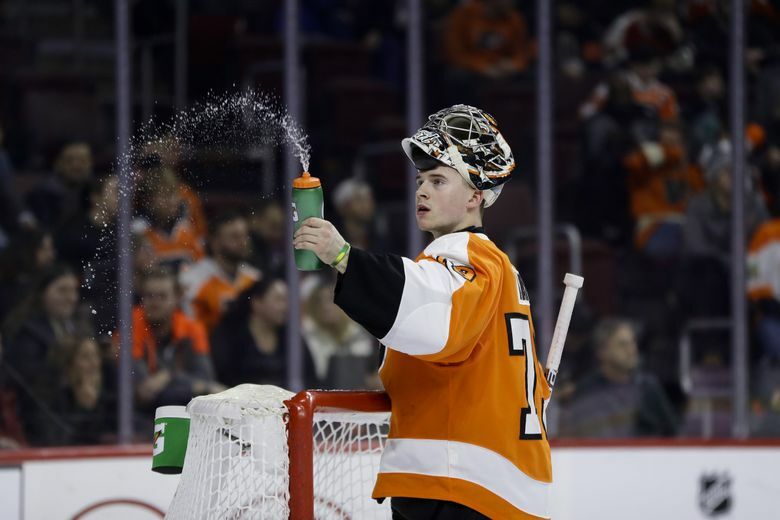 Carter Hart's team has no business being anywhere near an NHL playoff position. But based almost entirely on Hart's spectacular goaltending, the Flyers have won nine of 10 and have a shot at salvaging a season in which they've already fired their general manager and coach. Carter Hart managed his share of memorable feats tending goal for the junior Everett Silvertips. There was the long-awaited vanquishing of the Seattle Thunderbirds in last spring’s playoffs, followed by Hart leading the Silvertips to within two victories of their first Western Hockey League title. Before that, he helped Canada recapture gold at the World Junior Hockey Championships after losing it to the United States in heartbreaking fashion a year earlier. Not to mention, the unprecedented consecutive Canadian Hockey League Goalie of the Year honors he took home. But none of that compares to what NHL rookie Hart, at age 20, is trying to pull off with the Philadelphia Flyers. Almost entirely because of Hart’s stellar netminding, the onetime cellar-dwelling Flyers have won nine of 10 and suddenly are chasing a playoff spot after firing their general manager and coach. Hart, naturally, has to keep talking up his teammates. But a month ago, it appeared Philadelphia had a better chance of seeing Dave (The Hammer) Schultz elected to the Hockey Hall of Fame than the Flyers playing a postseason game in 2019. No team has made the NHL playoffs after being 16 points out, which the Flyers were in the race for the Eastern Conference’s final wild-card position. Hart embarked on a personal eight-game win streak, becoming just the second goalie in NHL history — Jocelyn Thibault in 1995 being the other — to do that before his 21st birthday. The Flyers had won eight straight as a team before losing 3-2 in a shootout to the Los Angeles Kings last Thursday with Hart getting the night off. Hart was back in goal Saturday, extending his personal streak in a 6-2 win over Anaheim. Hart was named NHL Rookie of the Month for January. Last Monday, he placed second in weekly league three-star honors for his performance the prior week. The Edmonton native is being whispered — amazingly, given his NHL debut was Dec. 18 — as a dark-horse Calder Trophy candidate as the league’s top rookie. Hart winning the Calder would see Seattle-area junior team alums claim their second straight such prize, with former Thunderbirds captain Mathew Barzal of the New York Islanders having taken it last year. But Barzal never put on a one-man show like this. Since Hart’s streak began Jan. 14, the Flyers have collected 19 points in their last 10 games after managing just 38 points in their first 45 contests. They’ve leapfrogged several teams and by Sunday were within a half-dozen points of that final playoff spot with two months of season remaining. The biggest reason is obvious: They’ve shaved about 1.4 goals allowed per game off their ledger on nights Hart plays. And that’s offset their mediocrity just about everywhere else. Defensively, Philadelphia remains just 25th of 31 teams in goals allowed even with the boost from Hart. And they’re nothing special offensively, their top point-getter being captain Claude Giroux — a veteran forward with one 30-goal season to his credit since being drafted when Hart was 7. Its only player with a shot at 30 goals this season is Sean Couturier, who has 23. In fact, Couturier may wind up the only Flyer to crack even 25 goals. You get the gist. The Flyers aren’t making the playoffs by winning many 6-5 games. They’re where they are because Hart gets his body in front of enough pucks to buy his otherwise ordinary team extra chances at victory. That was evidenced during last week’s Vancouver contest, in which Hart’s incredible right-armed diving block of a Nikolay Goldobin shot at a previously open net preserved a win with under six minutes to go. Half the team’s wins during their recently ended eight-game streak came with the Flyers scoring three goals or fewer. And they’ve actually allowed more scoring chances since Hart arrived than before. The rest of the team was again exposed in last week’s loss to the Kings, outplayed throughout at home by one of the league’s worst squads before a tying goal in the final minute of regulation salvaged a point in the standings. There is justified concern in Philadelphia that the recent streak is masking team deficiencies and hurting its draft chances for what remains a longshot playoff bid. Still, Flyers fans are clinging to Hart as their one “sure thing’’ amid the uncertainty. It’s rare any NHL draft pick touted as a potential franchise savior delivers so much right away, especially between the pipes. The last rookie NHL netminder to come out of nowhere to win a Stanley Cup was Cam Ward of the Carolina Hurricanes in 2006. Before him, Patrick Roy of the Montreal Canadiens did it in 1986 when he was Hart’s age as did Ken Dryden for the Habs in 1971. Ron Hextall of the Flyers almost did it in 1987, but fell just short in losing a seven-game Cup Final thriller to Edmonton and capturing the Conn Smythe Trophy as playoff MVP. Ed Belfour got the Chicago Blackhawks to a division title in 1991, while Tom Barrasso did the same for the Buffalo Sabres in 1984 as an 18-year-old. Steve Mason backstopped the Columbus Blue Jackets into their first playoffs in 2009. Otherwise, it’s been slim pickings the past 50 years. Hart — drafted by Hextall before his November firing as Flyer GM — isn’t close to capturing a Stanley Cup or division title and perhaps not even a playoff spot. But his Flyers supporting cast also isn’t nearly as good as the teams Hextall, Roy, Dryden and those other playoff goalies had in front of them. For now, historical comparisons aside, Hart’s record of 11-5-1, his 2.45 goal-against average and .926 save percentage have made him one of the most recognizable sports faces in a city boasting Joel Embiid of the 76ers and last year’s Super Bowl champion Eagles. Which shouldn’t surprise anybody as the Flyers continue to chase a playoff opportunity that, by all logic, has no business existing. Only Hart’s face has mattered in this unlikely Flyers resurgence, and that will remain the case until this in-season turnaround plays out to its natural conclusion.